-CB Play as Servers who play into CM followed by a return pass. -CB Now play into Full Backs who turns to find the Wingers, as Full Back plays into Winger, they continue to overlap down the flank. 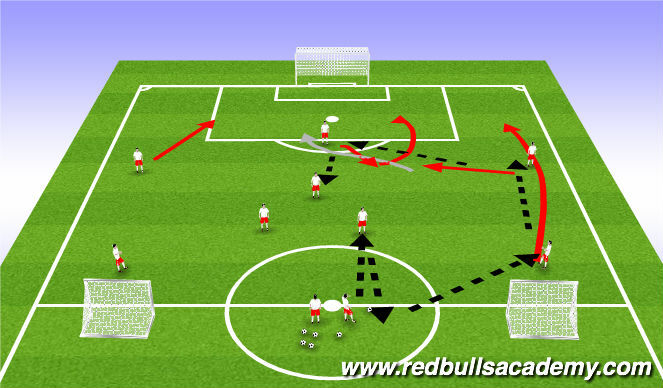 - "OR" plays the ball into the CM who finds the Wingers on the flank or changes the point of attack. - ACM can be used to play in behind or as a runner to withdraw a defender from play. CF must peel off the run and get into attacking position; instinctive quality. REPLICATE ON THE OPPOSITE SIDE.